Any printing done from ROBOTILL Manager allows you to choose the printer you want to use. On the POS Modules (ROBOTILL Retail and ROBOTILL Restaurant) by default the default printer on that specific computer is used to print all the forms (till receipts, quotations, intermediate bills, etc). It is however possible to print specific forms to specific printers. That is useful if for example you want to print a standard receipt to a POS slip printer but you want to print a laybye contract to a A4 printer. To choose specific printers for specific forms, in ROBOTILL Manager select 'Setup' > 'POS Printers' from the menu. Select the form that you want to print on a specific printer. The selected form and the current printer allocation will be displayed. 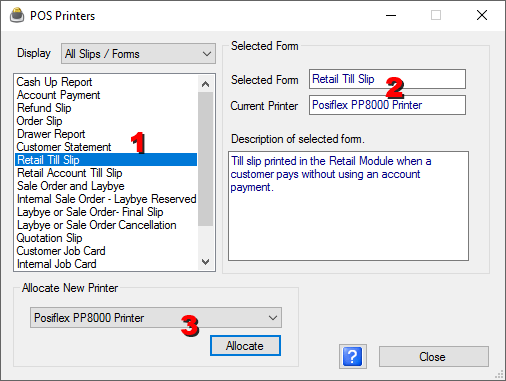 Select the printer you want to use to print the selected form and click on 'Allocate'. Note that if you use more than one computer, the same printer will be used by all computers (unless you select to use 'local default printer'). It is then important to either use a network printer or that the printer is installed on all computers that will print that form with the same printer name. The various slips can be designed for various paper sizes according to your requirements in the Print Design. Note that the Order Slips will be printed to the various department printers. If you have problems printing, see Printer Problems.